It was on the rolling green hills of central California, outside Vacaville, that Jim Upson wanted to build a custom home for his family. He had owned the perfect building site for ten years. Now, however, escalating construction costs and high contractor fees were major obstacles. How would construct his dream home, let alone a dream home on a budget? Then Upson met Ken Porter, Vice President of SIP Home Systems and a general contractor. Porter showed Upson how to save labor costs using prefabricated Insulspan® Structural Insulated Panels (SIPs). SIP Home Systems provided Upson with a conceptual design and then completed the house plans and engineering for the home. 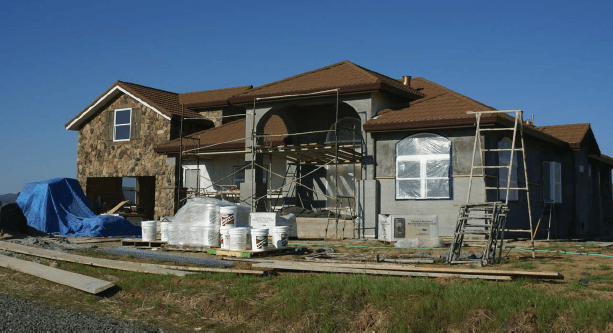 To further reduce construction costs, Upson decided to take a vacation from his day job as a branch manager for a masonry distributor and act as the general contractor for his new home. Even as a ﬁrst-time builder, Upson was able to build his home at a rapid pace using Insulspan’s ready-to-assemble system. The 2,300-square-foot, three bedroom home quickly came together, allowing Upson to lower the carrying cost of the construction loan. Upson also plans to save money on utility costs because of the high thermal resistance and airtight construction of Insulspan SIPs. With Upson’s specialty in masonry, plenty of stone was used in the Italian villa-inspired home. A decorative rock and acrylic stucco ﬁnish adorns the exterior of the home. Exotic travertine stone tiles comprise ﬂooring in the bathrooms. Although Upson is not ready to quit his day job just yet, he and his family really enjoyed the building process.